Angelina Jolie ordered to give Brad Pitt more access to their kids or risk losing primary custody. Angelina Jolie is being asked to give estranged husband Brad Pitt more access to their kids amid the duo's ongoing divorce negotiations. 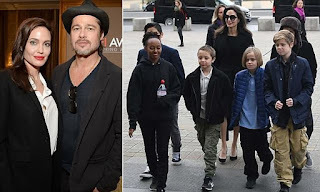 Jolie, 43, who has primary physical custody of their six children, has been told by a judge that she must let Pitt, 54, see the kids regularly while she films Maleficent 2 in the UK this summer. According to court documents obtained by news agent , the Superior Court of Los Angeles County determined that 'not having a relationship with their father' would be 'harmful' to Maddox, 16, Pax, 14, Zahara, 13, Shiloh, 12, and twins Vivienne and Knox, nine. The court believes the kids are safe with Pitt and that it's critical each of the kids have a healthy and strong relationship with both parents. Eldest child Maddox however will be able to choose how much time he wants with each parent because of his age.